In J.P.H. Tan’s Kate in the Land of Myths and Wonders, we discover that Kate is an only child, and a rich one at that, due to her father's and her grandmother’s wealth. Raised as a church-going girl, she is having a crisis of her faith in God. With a warning from her grandmother, Kate sets out for Chicago with her best friend, Gus, to celebrate her fifteenth birthday. While they are enjoying a stroll through one of Chicago’s iconic parks, and snapping some photos, the city is engulfed by a flood that drowns the city and sweeps everyone and everything apart and away. Kate is washed beyond the confines of this world and into a series of places where creatures of myth roam and natural weather phenomena have magical properties. She not only finds herself on an adventure she never dreamed of, but begins a journey of self-discovery as well. J.P.H. Tan’s Kate in the Land of Myths and Wonders presents us readers with a very human protagonist in the form of Kate, a teenager who has never had to without anything except for the attention of her father. Her grandmother instills in Kate what might be considered an old-fashioned faith in God and an intimate knowledge of the Bible. Yet, there is nothing preachy about Tan’s story. Kate’s faith and her subsequent dissatisfaction with it are presented as part of her process of growth and growing up. There is some teen angst, but it does not get in the way of the narrative, which is always spot on, providing a diverting, thoughtful read. I don't remember the last time I read such a well-edited book! The writer's voice is sure and unwavering. Well done! Kate in the Land of Myths and Wonders by J.P.H. Tan begins with Kate's fifteenth birthday when Kate is given a large sum of money from her grandmother to take a weekend trip with her best friend Gus. Her ideal trip takes a turn for the worst when the two friends are trapped in a flood. Suddenly everything changes and she finds herself in strange surroundings. She has no idea where Gus has vanished and she's drawn into a series of adventures, each weirder than the last. Then she meets the handsome and charming Claude, who has a mission of his own to help two supreme beings on a quest to find the Piscean Eye. But it's the attention of the wicked Queen Evrisx that could put her in grave danger as the queen has unusual experiments which have created strange and dangerous hybrids. The trip home won't be easy and the danger keeps growing, but when she discovers astonishing secrets, the answers she seeks could bring her home. The world is fairly idealistic as Kate is a rich heiress who gets a million dollars to take a weekend trip even though she's only fifteen years old. Kate's story begins in this near paradise and she has her head in the clouds with few worries in life, though her life does have some things not so perfect, such as her being more of a loner with only Gus at her side. She's sensitive to her surroundings where noises can be overpowering so she's set apart from everyone else. Despite being her best friend, Gus isn't seen much before he simply vanishes and is casually thought about throughout her adventures. Her idealistic world is quickly turned upside down and, in a 'down the rabbit hole' situation, she finds wondrous surroundings with a darkness to them. On the surface this other world is charming and enticing but with a gritty and dangerous side that brings her face to face with a wicked queen. She's held captive by an evil casino and placed in a suffocating cell where experiments on people are being held. It's a darker part of the story that's fairly creepy and blends science fiction through the use of experiments which are hybrids of animals and people. J.P.H. Tan incorporates biblical elements with a flood and other surprises that await Kate until the final reveal at the end. The strongest themes are those of faith, belief, and repenting in the eyes of God, each of which is a significant part of Kate's journey. She lost her faith in God years ago when her parents left and so spends the course of her journey rediscovering her faith and her destiny. Kate in the Land of Myths and Wonders is a tale of magic, wonder, and faith in a series of wondrous and dangerous adventures that begin with a flood and end with a shocking reveal. Kate is a rich, pretty, and privileged girl but she is also lonely and her struggles with a sensory disorder make it difficult for her to make friends. Her mother left Kate with her rich father as a young girl, never to be seen or heard of again, and a few years later she lost her father too. Now, she lives on an estate with her grandmother, the founder of a successful cosmetics business. On her fifteenth birthday she travels from New York to Chicago with her best friend, Gus. Both amateur photographers, the two friends are trying to capture the best image of the Bean in Millennium Park when a flash flood hits the city. Kate and Gus are separated in the ensuing chaos but she runs into somebody unexpected and finds herself whisked into a peculiar world. J.P.H. Tan’s debut YA fantasy is a whimsical interpretation of the Christian apocalypse scenario that features clever and subtle incorporation of the more striking omens, such as the stars falling and the mark of the beast. While I felt that Kate was at times a little too much of the typical ‘poor little rich girl,’ she remains a relatable character in terms of the challenges she faces. The assumption that everyone is Christian, or knows enough about Christianity to understand the apocalypse omens was a little jarring. 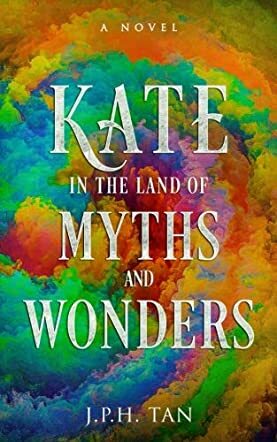 Overall, Kate in the Land of Myths and Wonders is a rather charming fantasy with strong Christian elements that will probably appeal best to younger YA readers seeking a touching, thoughtful novel with an immersive and vividly imagined setting. Kate in the Land of Myths and Wonders by J.P.H. Tan is the story of a teenage girl called Kate who has just turned fifteen. Her mother left when she was young, along with her little brother, and her father died of a heart attack. She has quite a blighted view of the world and feels that her life is quite boring. But that all changes when she goes on a trip with her friend, Gus. I think that Kate has an unusual life and the fact that she has been given everything, including a check for a million dollars for her birthday (that's a heck of a present) shows that she has no real idea of the world. She's bored because everything comes easy to her. J.P.H. Tan has written and interesting book with Kate in the Land of Myths and Wonders. The fantasy element of it is a little reminiscent of Dorothy from the Wizard of Oz and Alice from Alice in Wonderland, but this story has more Christian overtones. It is about growing up, coming of age and dealing with difficult situations such as death. The author has Kate believe that she is odd, but I don't think she is as odd as she thinks she is. Of course, most teenagers feel different and isolated at some point in their lives. I think this book would appeal to young teens - around twelve to fifteen years old, but slightly older teens might enjoy it too. I would recommend it as it was quite an enjoyable story to read.